Great tips. Personal trainer approved! 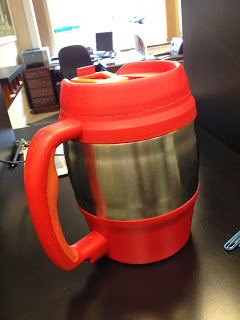 I carry a gallon around with me at work in the summer. Thanks! It’s something I have to think about a lot...it’s easy to slip up and stop drinking enough! 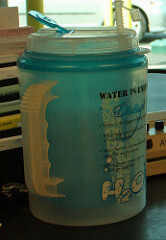 Adding things to water means when you drink it, insulin production starts. It is no longer “water”. Even if there are no calories. I drink water all day = no idea how much but it's all day. Actually scrap that, I drink water all day monday to friday - on the weekends I do slack a bit. When I want something special, I drink sparkling water :) No juice or pop for me in over a year (unless it's tonic with my gin)! It really is the elixir of life isn’t it! I still struggle to get enough water, but I did quit soda. I can't go with the big mugs. They are just too bulky and hard to hold so for now it's 16oz bottles. Thanks for the tips and reminder. I'll try to increase my water. Lol. Yeah they are totally unwieldy!!!! That’s what I don’t miss!! I typically do much more water during the weekdays also...and slack on the weekends. I’m trying to fix that though!!! I have a 32 oz Rubbermaid plastic bottle so I know if I drink that twice a day, I'm good to go!! Great tips, thanks so much!! Way to go on having a method to make sure you get your water in!!!! Keep it up!! !